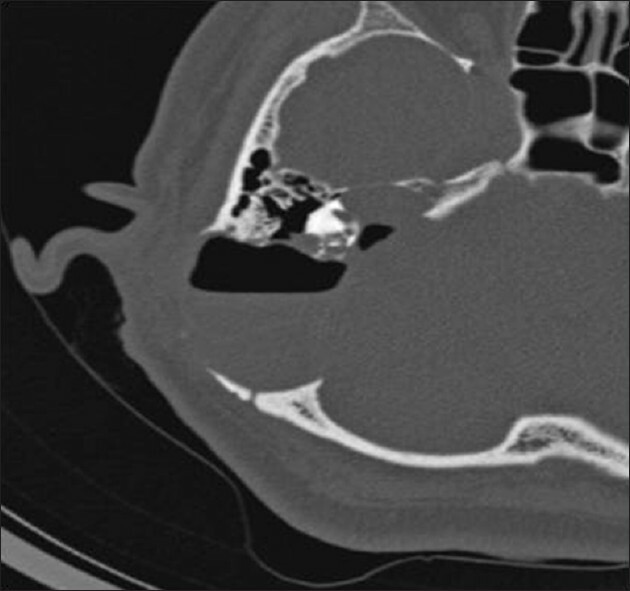 A rare case of congenital cholesteatoma of petrous apex in 49-year-old female is presented here, who was surgically managed successfully with the post-operated facial nerve improvement. Congenital cholesteatoma of the temporal bone is a rare disease and involvement of petrous apex is very rare. It has to be distinguished from other lesions of cerebello-pontine angle and petrous apex like cholesterol granuloma, archanoid cyst, mucocele, epidermis cyst and acoustic neuroma etc., Overall incidence of congenital cholesteatoma ranges from 2% to 5% of all cholesteatoma cases. Male predominance of 3:1 is seen. Congenital cholesteatoma may arise from the embryonic inclusions of the epidermal portion of the epiblasts during the closure of neural tube. Cholesteatoma of the petrous apex originate from epithelial cells from sesells pouch which get encased with the fibrocartilage of the foramen lacerum during cephalic flexure and may give rise to cholesteatoma in later life thus neuroectodermal in origin. It is well-known that congenital cholesteatoma of petrous apex may occur without otorrhoea and in otherwise normal temporal bone. Facial nerve deficit is the first presentation to occur followed by a unilateral sensorineural hearing loss. Computed tomography (CT) scanning is an important investigation for various lesions involving the cerebello-pontine angle. Cholesteatoma doesn't have specific radiological sign on CT scan and therefore, very difficult to diagnose. But rarely any case of congenital cholesteatoma of petrous apex has been reported at an age of 49 year in a female patient. There are several surgical approaches for petrous lesion. The middle cranial fossa approach is preferred by neurosurgeons, and the transmastoid translabyrinthine approach is preferred by otologists. 49-year-old female patient presented with progressive vertigo since 2 years, which worsened over last 8 months. 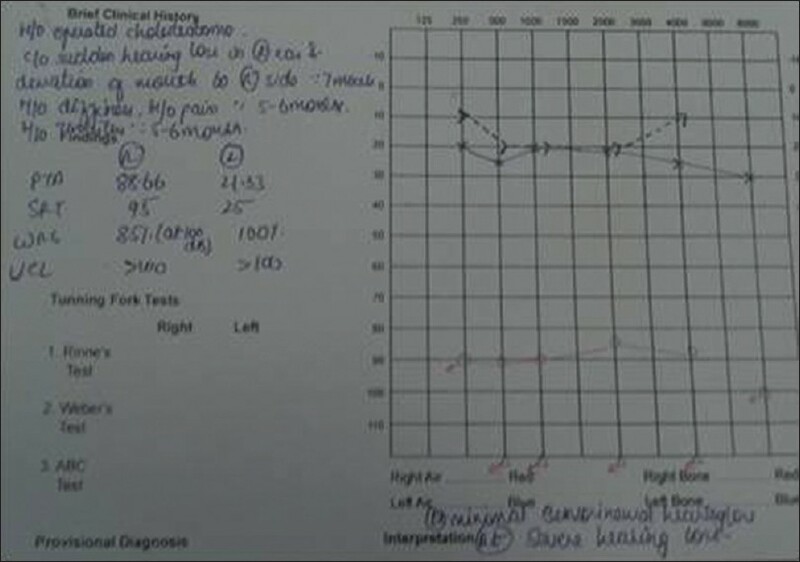 Patient developed tinnitus and hearing loss in the right ear since 7 months. 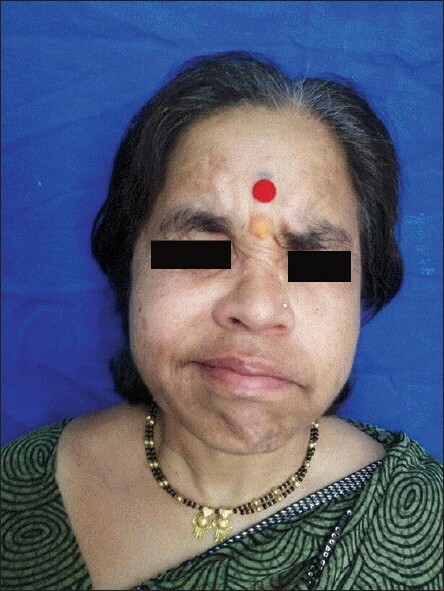 She noticed right sided facial asymmetry 6 months back, which progressed to complete facial nerve palsy. At other center patient was initially diagnosed and treated as Bell's palsy. From there she was referred to neurosurgeon in Bharati hospital as CT scan showed cerebello-Pontine angle lesion. 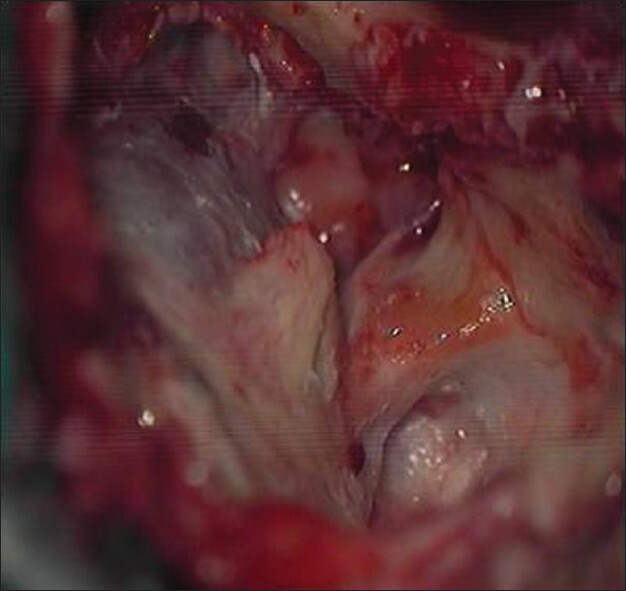 During neurosurgical exploration neurosurgeon detected cholesteatoma at very early stage involving mastoid, thus, case was with held and referred to Ear Nose Throat Department. Complete Ear Nose Throat evaluation revealed normal right tympanic membrane, complete right lower motor neuron facial nerve palsy and profound sensorineural hearing loss in the right ear on pure tone audiogram [Figure 1]. Cerebellar signs were positive. Magnetic resonance imaging (MRI) and high resolution CT with contrast temporal bone was advised to see the extent of bony involvement in the temporal bone and skull base. This showed 4.5 × 2.3 × 4.6 a bony destroying (lytic lesion) lesion involving mastoid, posterior external auditory canal, bony labyrinth, petrous apex, and internal auditory meatus [Figure 2]. Facial nerve and vestibular cochlear nerve was compressed by abnormal soft tissue present in the internal auditory meatus. Patient was explored transmastoid translabyrinthine for petrous apex lesion. Intra-operative extensive bony erosion by cholesteatoma was noted in the temporal bone as destruction of posterior external auditory canal, lateral cortex of mastoid, mastoid air cells, bony labyrinth and internal auditory meatus. Due to extensive bony destruction sigmoid sinus, posterior fossa dura, jugular bulb area and middle cranial fossa dura were exposed. There was erosion of Internal Acoustic Meatus compressing VII and VIII nerve bundle. Internal Acoustic Meatus was completely cleared of cholesteatoma, thus decompressing VII and VIII nerve bundle [Figure 3]. Cholesteatoma was extending beyond Internal Acoustic Meatus towards petrous apex which was carefully and pains takingly removed. Inferiorly cholesteatoma was extending towards jugular bulbar engulfing lower IX, X, XI nerves. All cholesteatoma was cleared carefully preserving continuity of nerve bundles. Cholesteatoma from dura over arcuate eminence was removed. All the efforts were taken towards complete surgical removal of cholesteatoma. Cavity obliteration was not done. Post-operatively patient was relieved of vertigo and tinnitus. Facial paralysis and hearing didn't improve and was same as pre-operative. Histopathology was suggestive of cholesteatoma. Repeat check CT scan is planned after 6 months. Regular follow-up for facial nerve improvement and 6 monthly MRI is planned for residual cholesteatoma. Congenital petrous apex cholesteatoma is very rare case. With no specify radiological signs congenital cholesteatoma is difficult to diagnose pre-operative. It was a challenge to treat surgically such a rare case with extensive neurosurgical presentation without any neurological deficit. Patient showed improvement of facial nerve after 1½ year of surgery [Figure 4]. 1. Torun F, Taficiolu A, Tuna H. Primary petrous apex cholesteatoma: A case report. Turk Neurosurg 2004;14:28-32. 2. Phle GM With RJ Petrous apex cholesteatoma: Exteriorization vs subtotal petrosectomy with obliterationn. Skull Base Surg 1991;1:97-105. 3. Horn KL. Intracranial extension of acquired aural cholesteatoma. Laryngoscope 2000;110:761-72. 4. Achilli V, Danesi G, Caverni L, Richichi M. Petrous apex arachnoid cyst: A case report and review of the literature. Acta Otorhinolaryngol Ital 2005;25:296-300. 5. Komune S, Nakagawa T, Haruta A, Matsuda K, Tono T. Management of cholesteatoma in the petrous apex. Skull Base Surg 2000;10:47-51. 6. Yanagihara N, Nakamura K, Hatakeyama T. Surgical management of petrous apex cholesteatoma: A therapeutic scheme. Skull Base Surg 1992;2:22-7.